Pay day is one of the most important days in an employee’s life. This is because it gives the employees a sense of satisfaction that the blood, sweat, and tears that they have given up for the sake of their work has finally paid off—literally! As an employer, it is your duty to ensure that your employees’ salary gets to them on time. Getting their salaries on time boosts their morale which ends up improving their motivation to do their job. It is also highly important that pay and taxes are calculated in an accurate manner. No matter how minimal errors in calculation may be, you do not want to upset employees. There are benefits of outsourcing payroll but there are also a couple of benefits to doing payroll on your own. One of these benefits is the fact that you can save a couple of dollars by calculating and processing your own payroll. If you think you have ample amount of knowledge regarding calculating payroll, you can definitely make use of Excel or any other similar applications that can help you come up with your very own payroll spreadsheets and worksheets, and be able to calculate your company payroll in an organized manner without the need to shell out money for software and outsourced accountants. 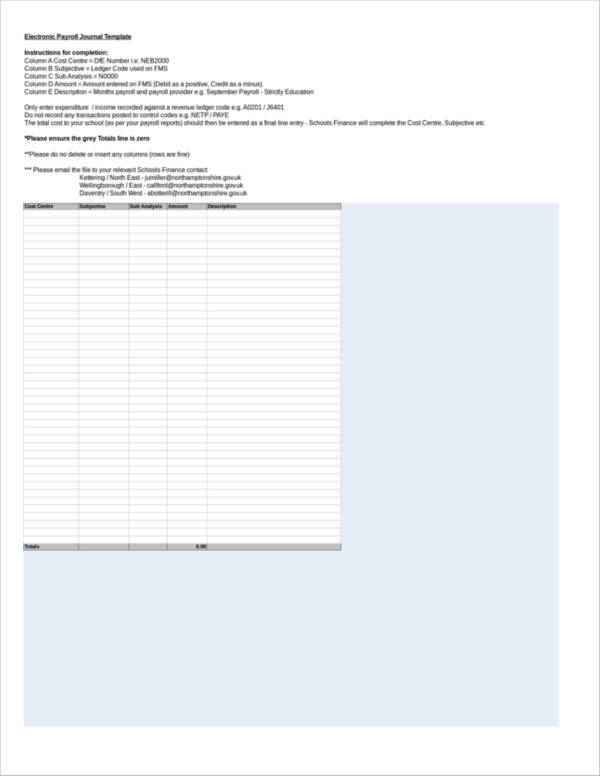 With that being said, we would like to give you a couple of guidelines to help you come up with your very own payroll spreadsheet. 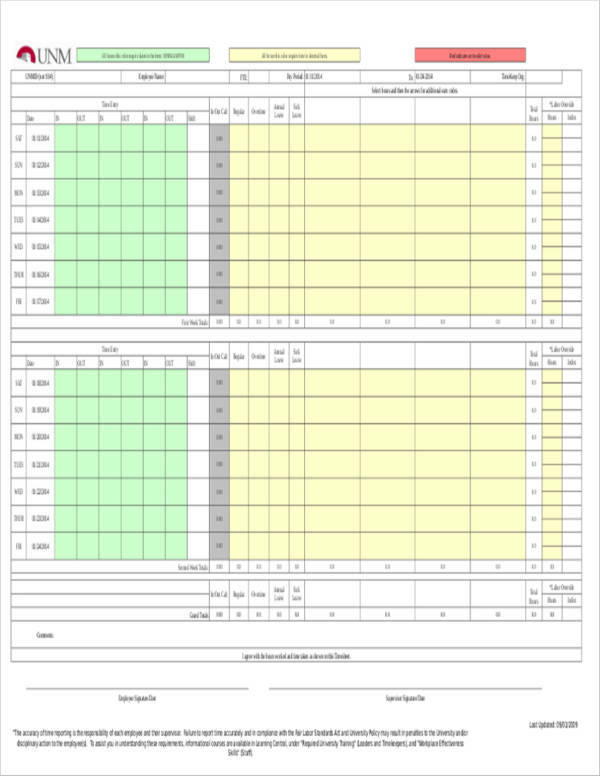 We have also uploaded a couple of free payroll templates and samples that can make the creation of your company payroll worksheet easier than ever. Now the big question: Are you ready to explore and learn more about payroll? We promise to share more information with you if you also promise to continue reading this article. Let’s do this! 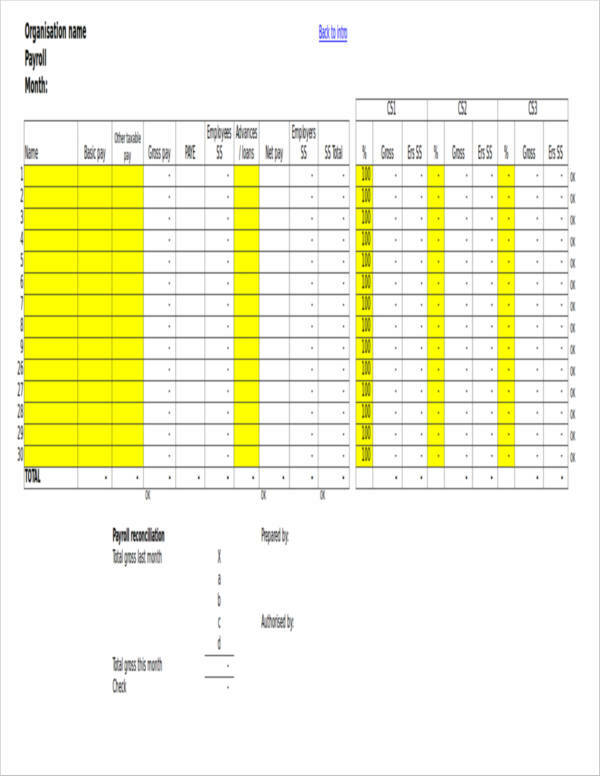 What Are the Elements of a Payroll Spreadsheet? The elements of a payroll are not that complicated. In fact, there are only a couple of things that are included in it. The basics are the names of your employees, the hourly wage, the deductions such as taxes, and other specific data that is specific to the employee. The gross pay of an employee is also reflected in the payroll as well as their net pay or take home pay. What are the common terms that you will find in a payroll? Payroll – Payroll refers to the process of calculating the pay that you owe an employee for a specific period of time. Taxes – There are a lot of taxes that is deducted from an employee’s pay. This can include income tax, state tax and federal taxes. Taxes are being used by the government to properly fund roads maintenance, parks, health care system, Social Security, and workers compensation. Total hours worked – This refers to the total number of hours worked by the employee that he/she has rendered for a specific period of time. Overtime hours – This refers to the hours extended by the employee that is beyond the required number of hours for a specific period of time. Hourly wage – This refers to how much an employee would get for an hour’s worth of work. Salary wage – Salary refers to the fixed amount of money that an employee will get for a specific period of time. Gross pay – Gross pay refers to the total amount of pay an employee gets without the deductions. Net pay – Net pay refers to the amount of money that is given to the employee once all of the deductions have been made. With the wide variety of payroll software available on the Internet, a lot of business owners tend to turn to these as they are more convenient. 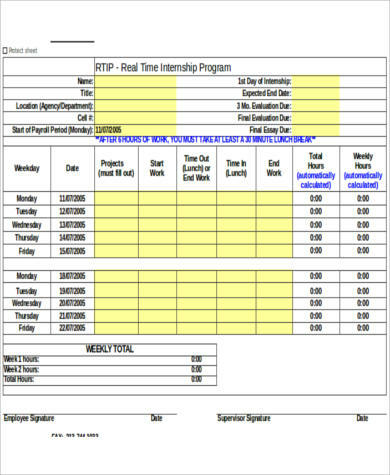 By feeding the software with the updated employee timesheet calculator and by customizing the software according to the company’s preferences, it can automatically compute the company payroll. However, we know that there are those business owners who still want to do things manually and be hands-on with their employee’s payroll. This may not be applicable to all businesses but to some, this is what works best for them. While doing it manually may be a time-consuming task, you are sure to be in total control of everything and you are aware of the pay. Should there be discrepancies, you can also readily show the employee how you went about the computation of the pay. 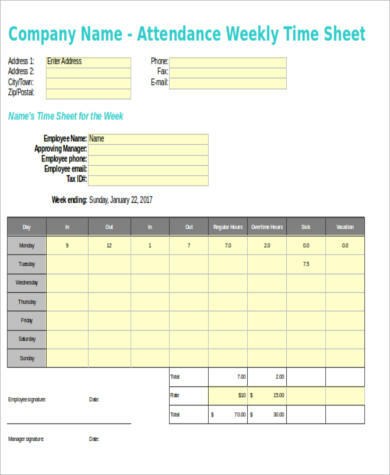 One of the best tools for doing manual payroll would be through Excel or similar spreadsheet applications that is readily available on your laptop or computer. 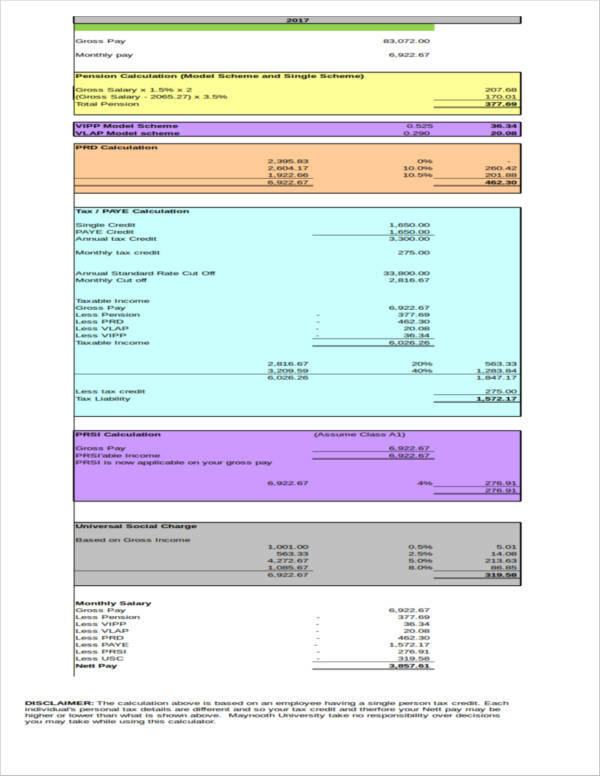 With Excel, you can create a simple yet functioning payroll template that can automatically compute taxes and other deductions. 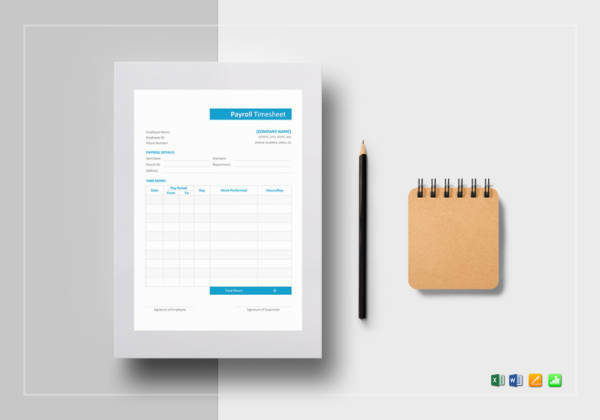 The employee payroll template that you would be creating can be something that you can use over and over again for every pay period of the company. Best thing about this method? The tools you need are free! You think creating payroll spreadsheets are complicated? Think again! Coming up with your very own employee payroll is actually easier than you think. Want to know what these simple tips are? Check it all out here. More often than not, the laptop you bought will have Microsoft Excel readily installed in it. However, if you have bought a laptop with no operating system or if your laptop does not come with a free licensed version of Excel, you can still definitely make use of freeware such as OpenOffice or LibreOffice. 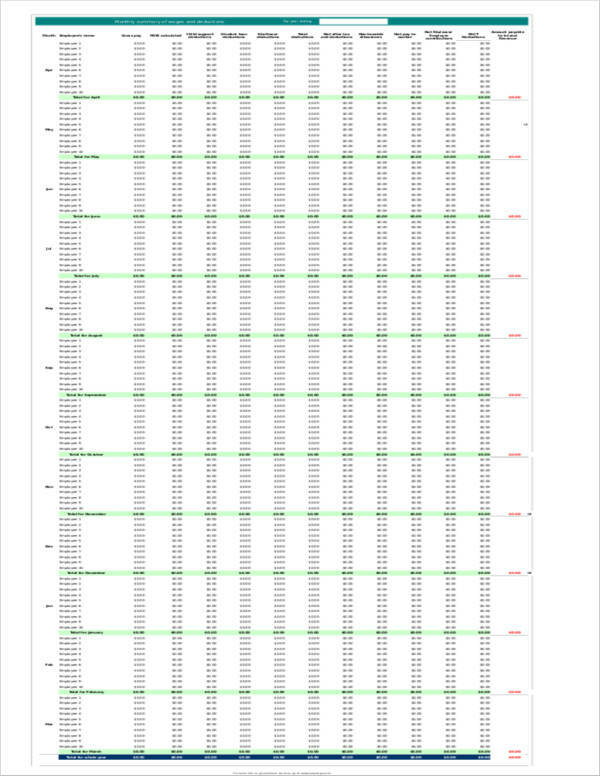 Once you have Excel or an application similar to Excel, it is time for you to open a new spreadsheet. 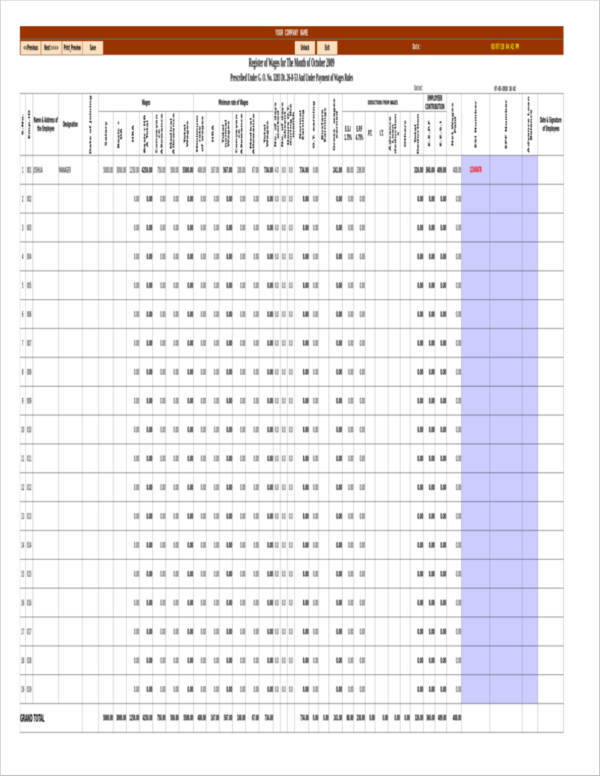 The new spreadsheet will serve as the base of your template. making the font size a whole lot bigger than the rest of the wordings included. How you want the labels to look like all depend on your preference. Excel or other spreadsheet applications are great for their features that help to automatically calculate data. 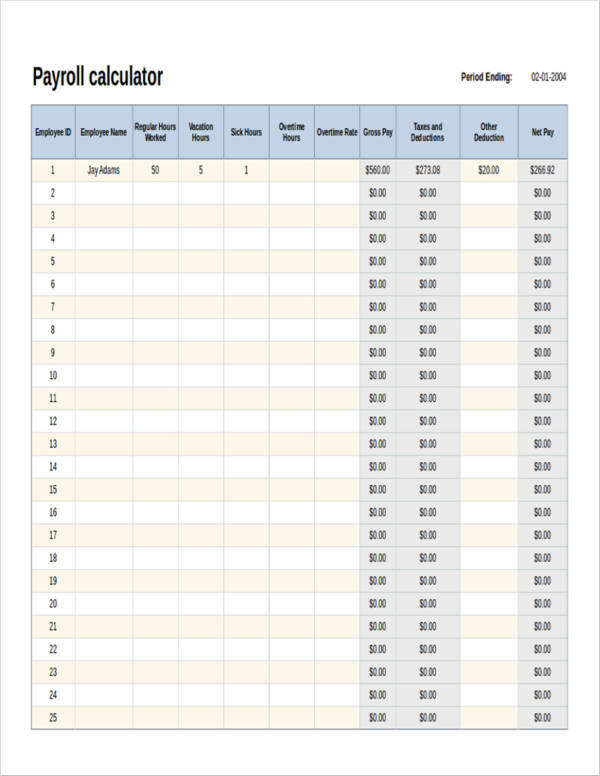 To do this, you can easily assign a mathematical formula to a specific cell or an entire column. This means that when you make any change, the cells will automatically make updates. For payroll, here are a couple of formula examples that you can use in order to make calculation of pay a breeze and the labels or cells that do not need any special formula. 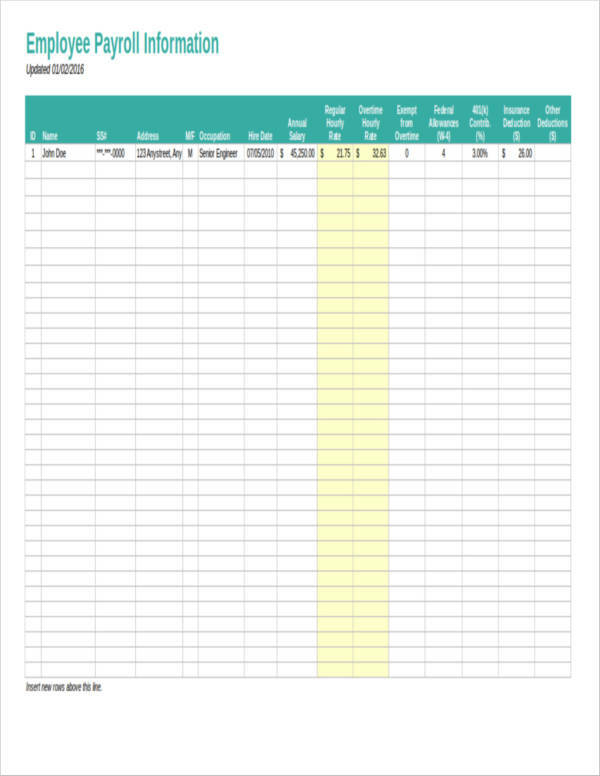 Name of employee – Simply enter the name of the employee on every row. Pay rate – Enter the hourly rate of the employee without any currency sign. Total hours worked – Enter the total number of hours worked by the employee for the specific pay period. Overtime pay rate – Enter the overtime pay that an employee is entitled to for every overtime hour rendered. 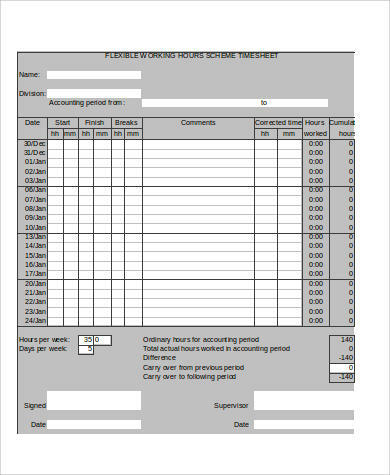 Total overtime hours – Enter the total amount of overtime hours rendered by the employee or the total excess hours rendered for the pay period. Gross pay – The gross pay of an employee refers to the amount of pay of the employee sans any deduction. 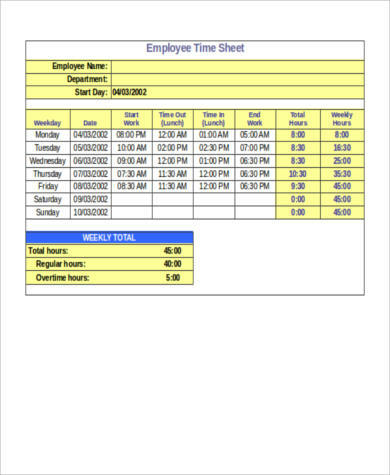 To calculate gross pay, multiply pay rate with the total hours worked (Pay Rate × Total Hours Worked) and multiply overtime pay rate with the overtime hours rendered by the employee (Overtime Pay Rate × Total Overtime Hours). 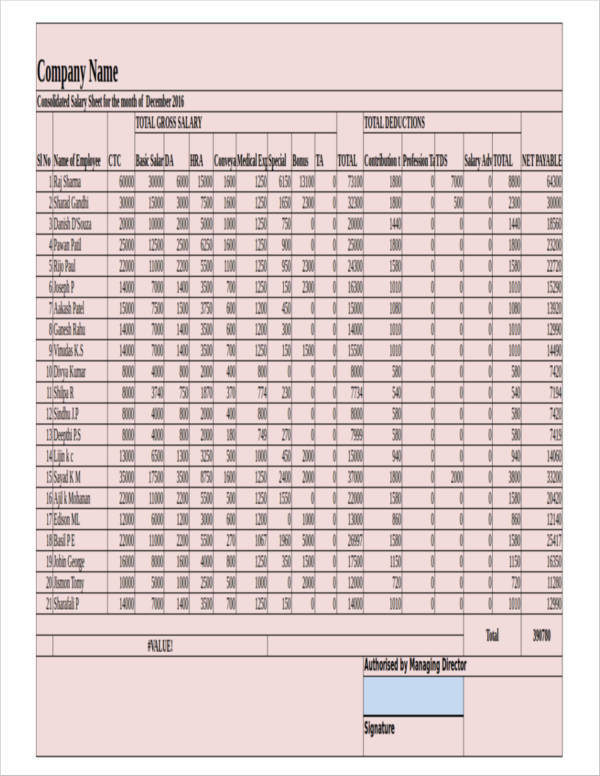 After computing the two formulas, add up the results [(Pay Rate × Total Hours Worked) + (Overtime Pay Rate × Total Overtime Hours)]. Income tax – Most of the employees you will be employing will also be paying taxes. The first things you should figure out is to determine how much taxes will be deducted from the employee’s pay. Let us say the taxes to be deducted is 5% of the gross pay. To calculate the income tax to be deducted, multiply the gross pay with the tax percentage (Gross Pay × 5%). Other deductions – Other deductions will all depend on the company. Other deductions may include Social Security fees, insurances, Medicare, and more. 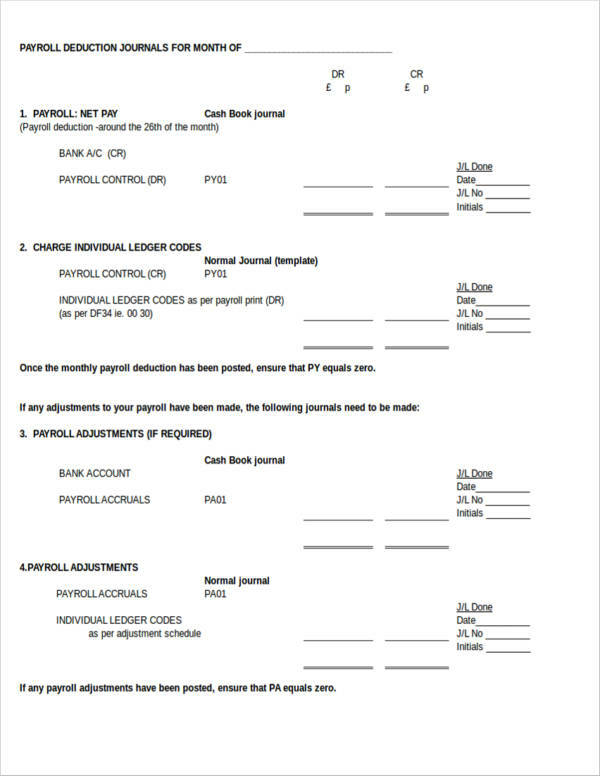 Net pay – Most of the time, the net pay is the last column in a payroll. The net pay is the amount of pay that an employee will get after all the deductions have been made [Gross Pay – (Income Tax + Other Deductions)]. Note that the formulas can be dragged downward. This means that there is no need for you to manually enter the formulas one by one. You can find out more about preparing payroll in Excel by reading up on our article regarding Creating Payroll in Excel Using Simple Tips. What we have shared above are just some of the most important steps to set up your small business payroll solution. Now that you have set up the basics, it is now time for you to customize the payroll and make it look unique. 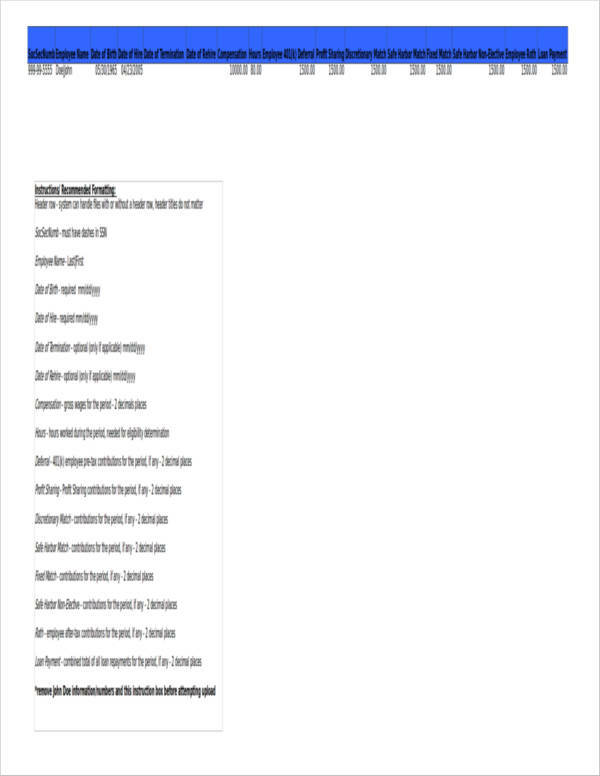 What you can do is to bold titles, align titles to the center, make other sections have different font sizes or font styles. Play around with font styles and cell colors until you find a look that works for you and your company. Save it and name it in a file name that you would make it easy for you to search for it. Ensure that the data in your spreadsheet are update. Double-check the formulas you have entered and make sure that when updates regarding pay are made, such as an increase or any additional deductions, should be included in the payroll. 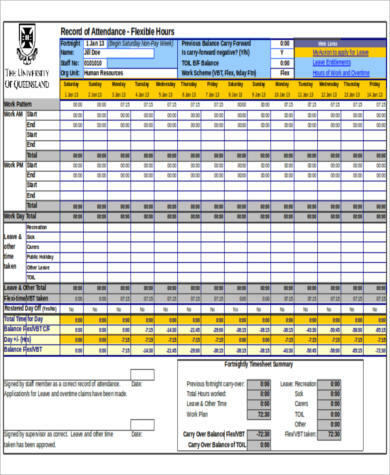 Excel spreadsheet templates may not look as fancy as the ones included in a software but it is definitely convenient and is also a cost-effective means of calculating payroll. With its drag features, you can also make sure that you are able to save time and you will also be able to lessen the hassle. One more way of being able to save time? 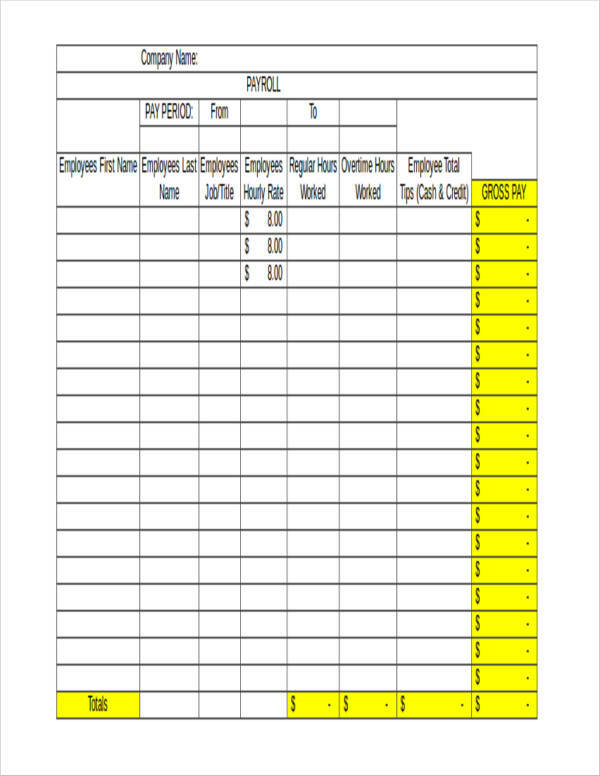 Checking out the printable payroll templates that is included in this very article. They are pre-filled with formulas and labels. All you need to do is to edit or customize it according to the needs of your company. Once you have set up everything, you are good to go! All you need to do now is to input all the necessary information for the specific pay period and for sure, the pay f your employees will be automatically computed. Processing payroll taxes can be quite a chore. You have to first figure out how much you will need to pay your new hire. After that, you will have to check out a tax table in order to cumpute the taxes that you would need to deduct from the gross pay. In order to do this, we would like to give you a step-by-step guide on how to do payroll taxes and process payroll yourself. You may still want to consult a payroll expert if you want to make sure that you are doing everything right. Federal taxes, state taxes, and local taxes all fall under taxes that can be deducted from an employee’s pay. It also includes Social Security fees, medical insurance, and income taxes. Knowing the current tax rates is also important if you want to make sure that you are able to properly and accurately compute for the taxes of your employees. You can take a look at payroll tax basics by reading up on Payroll Tax Basics for Small Business. Processing payroll on your own can be a bit time-consuming and you may also find that errors are quote inevitable when it comes to doing payroll on your own. However, if you have taxes covered and you feel like you have a good grasp of processing taxes, you will surely find that the DIY payroll processing may be the one for you. Just make sure that you are confident enough to do it on your own before you start to dive in to the adventure of doing the payroll on your own. Make sure that your employees fill out a W-4 form. All employees need to complete a W-4 form. 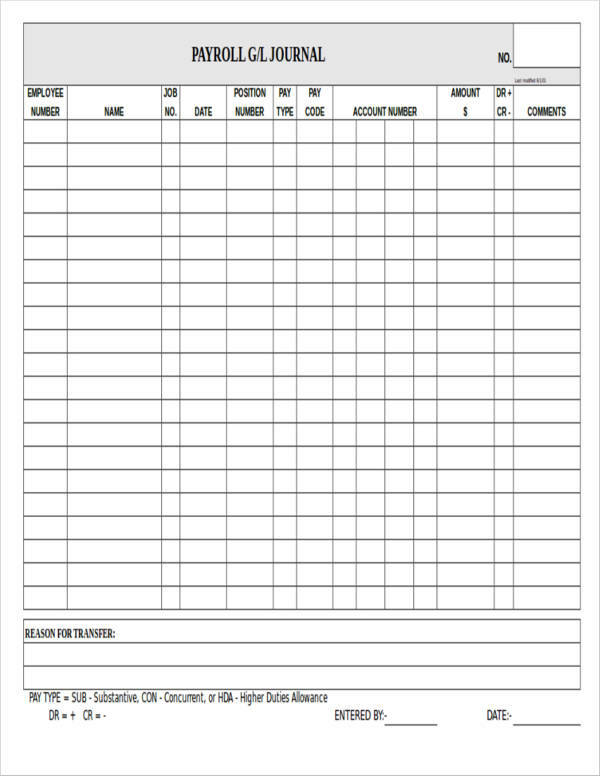 This form will be best for ensuring that the payroll register templates you have prepared will be filled out with the correct or accurate information that you would need to ensure that computing payroll would be a breeze and will not take too long. The W-4 form will also help you determine the allowances your employees are entitled to and deductions that you would need to take from the pay. Sign up or register for an EIN. An EIN or Employer Identification Number is a unique number assigned to every business. It is kind of like the SSN of your business but slightly different. An EIN is used by the IRS to distinguish you from the other businesses. 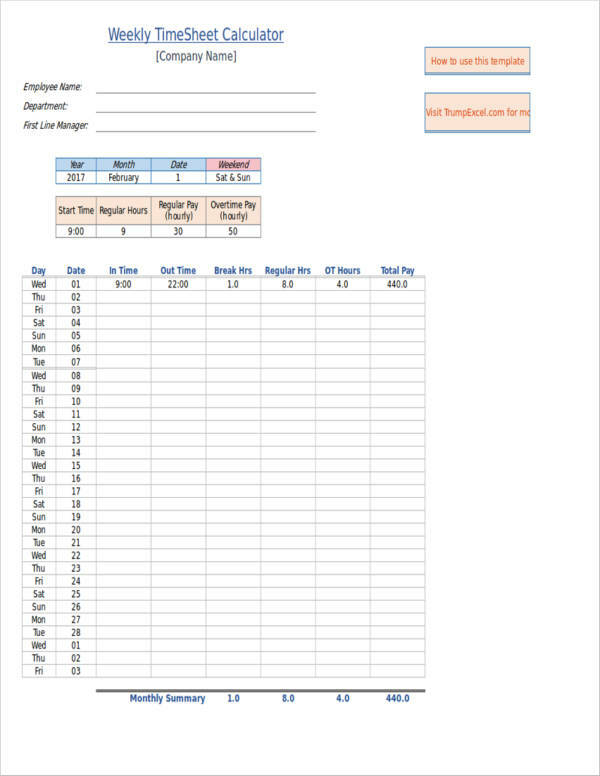 Set up a payroll schedule. When coming up with a schedule for payroll, you have to make sure that you also consider employee tax date deadlines, tax due dates, and tax filing deadlines. Choose a date that would be convenient and will not need you to go procrastinate to finish one payroll task and another. Calculate taxes and withhold the taxes. Determine the amount of taxes that you would need to deduct from your employees’ pay. You can refer to tax calculators in order to accurately determine the amount you would need to deduct. Keeping track of the portions that you need to contribute for taxes and the employee portion of taxes is vital. You can take a look at our Payroll Tax Calculator Templates to Download to help you out with payroll tax calculations. Pay the taxes. When tax deadlines come up, make sure that you are able to pay it in a timely manner. This is usually done on a monthly basis. File tax forms and employee W-2 forms. W-2 are forms that you issue to your employees at the end of the year. This way, they would have an awareness as to how much their annual filings are. Be sure that you are prompt with the filings. You can gain more information about taxes and other payroll tips by checking out our article entitled Payroll Tips from a Tax Professional. 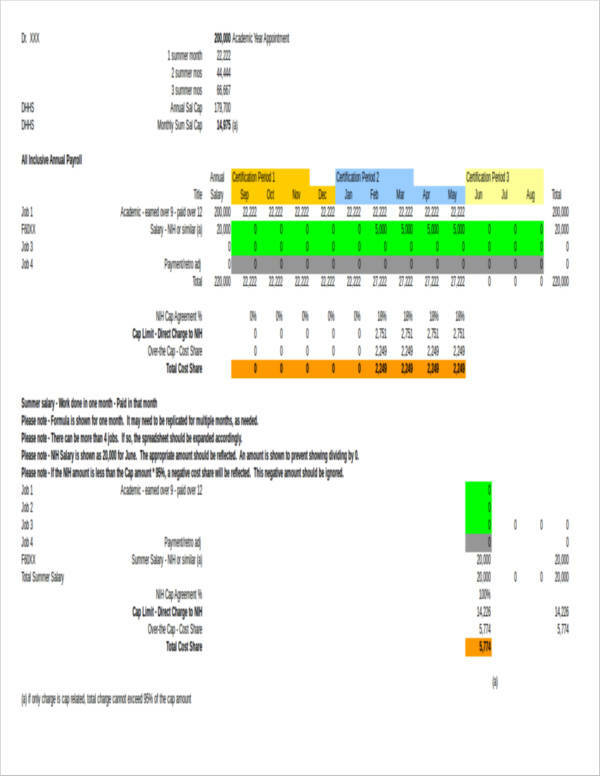 Why Make Use of a Spreadsheet? 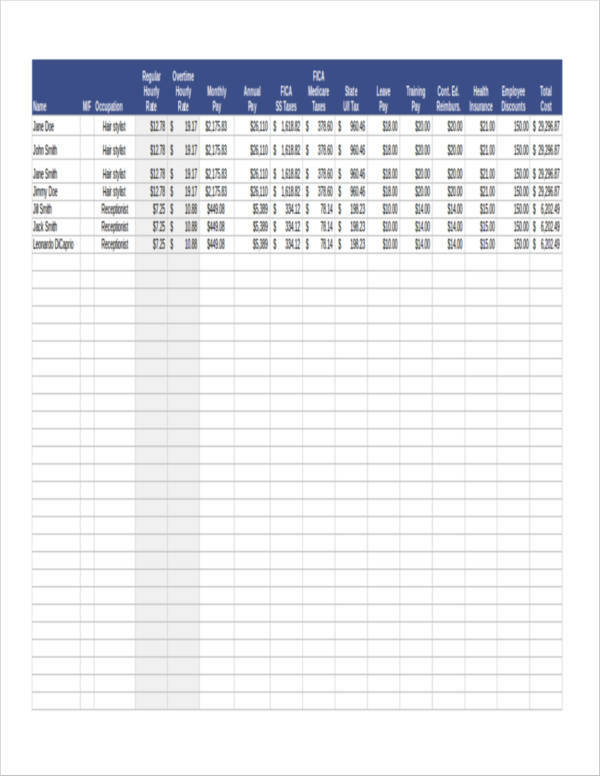 You can make use of whatever application is available on your computer such as text editor applications, but making use of spreadsheet applications will be more convenient because of the capacity of spreadsheets to accurately calculate and tally up totals. 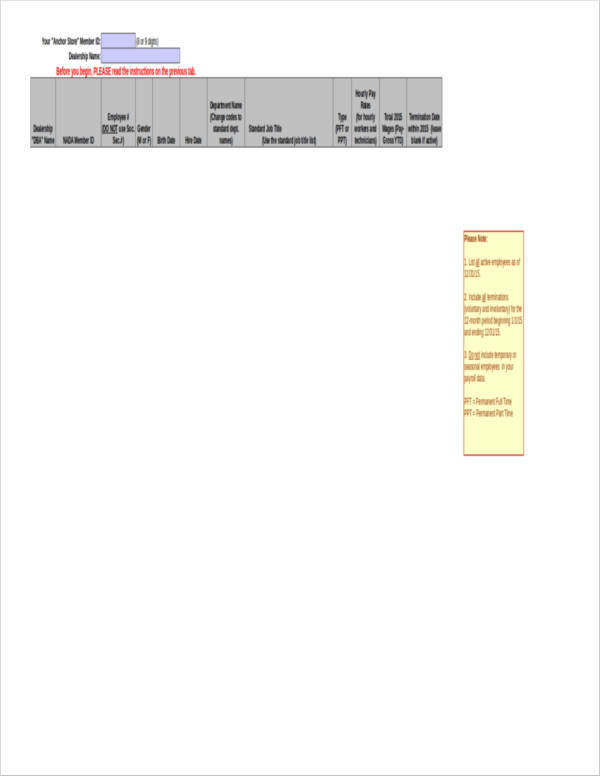 You can also edit texts in spreadsheets just the same way in a text editor. You can also easily input formulas and calculations in a spreadsheets that would make quick calculations that would make it easier for you to know how much you owe your employees. You may think that payroll will just involve addition and subtraction but it does involve a whole lot more than that. Sometimes, things work out in ways that you do not imagine it to. Sometimes, you think you need to outsource an accountant in order to come up with an organized company payroll. But sometimes, rethinking what your company actually needs can be a huge step that can help you save on money. This is when Excel payroll spreadsheets come in handy. You have to consider that there are a couple of risks involved when it comes to doing your very own payroll, but you have to be always ready. While a payroll software can take care of all of these things with just a couple of clicks, being hands on with the accounting of employee salary can help you answer some questions regarding any discrepancies in a better manner as you know the whole process. Payroll is important and can even help you understand the regulations and taxes even more. Worried that you might not make it to the deadline of your pay period? You may want to check out How to Pay Employees When You Can’t Make Payroll. Pay is important, which is why you should take responsibility even if you are going to be late with it.